There is no need for a limo when you can have a beautiful horse pull your carriage through town to a private beach area for your wedding ceremony. 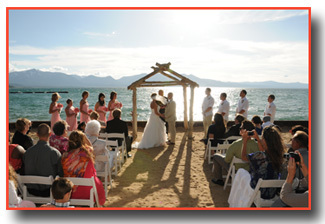 The private coach will depart from the center of town near the casinos and will carry the bride and groom or selected bridal party members to the ceremony site, which is an enjoyable stroll to an eye-catching beachside location. The coach’s capacity allows up to 6 people, so all other guests that will attend your wedding will meet at the event area. Provided for you at this private venue are chairs to accommodate all your guests, an arch, traditional wedding march music, a staff member to greet and direct your arriving guests, and a spectacular backdrop for the wedding photos. This lakeside beach location is not only an enthralling ceremony site, but it’s also an ideal spot for convenience as it is situated in the central part of town. Additionally, the lakefront venue is very spacious and can accommodate large parties of up to 150 guests, suitable for either formal or informal attire. 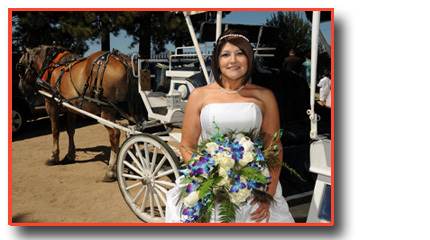 As an added luxury (at additional cost), the horse drawn carriage can remain until the ceremonial event concludes and carry you and your new spouse away to the reception banquet or other preferred destination (if within 1 mile of the wedding site). Be sure to bring your favorite bottle of champagne for a celebratory toast along the way. A second option for those couples who would prefer a smaller, more intimate ceremony is to direct their horse drawn carriage to a local wedding chapel for an indoor ceremony. 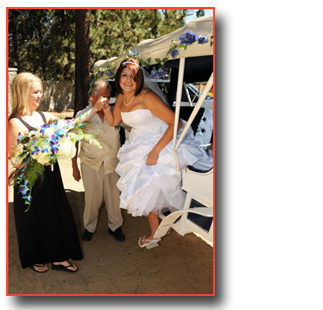 Departing from the central part of town close by the casino area, your carriage ride will proceed through town to a quaint chapel nearby the beautiful shoreline of Lake Tahoe. The chapel seats up to 50 guests.